Dubai, UAE, December 18, 2018: We end our 25th anniversary year with a collection inspired by our home: New York, New York (a city so nice they named it twice). Weaving together hints of uptown glamour, dashes of artistic downtown glitz and nods to Brooklyn's eclectic, relaxed edge, our holiday collection captures the magic, creativity and joy of our favorite city, where anything is possible and there's always something to celebrate. Romantic mini and midi chiffon dresses come in a palette of pale pinks and night-sky blacks, and an array of prints, from dots and florals to houndstooth and hearts. Chunky knit sweaters with dramatic sleeves are as cozy as they are chic, and pair nicely with a gold pleated skirt. A menswear-inspired pink pantsuit is an unexpected look that can be worn together or as separates. 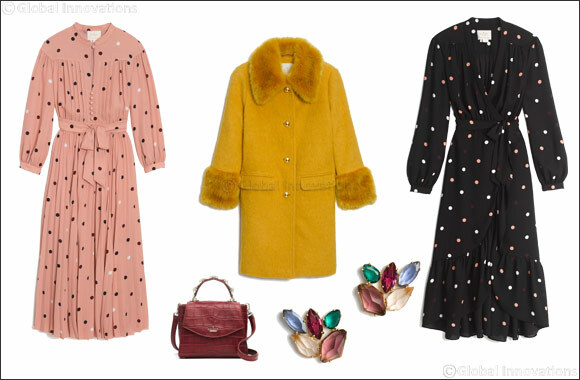 And in outerwear, a velvet puffer and a houndstooth wool overcoat with bright pink faux fur trim are twists on classic styles. Shearling, faux fur, sequins, jacquards, satin crepe, chinoiserie-inspired silks, mikado twill and velvet are just some of the luxurious fabrications and finishes that define the collection. A dramatic shearling coat in rose dew is a statement piece that can be dressed up or down. Flowy dresses, intricately crafted from layers of chiffon or floral-print silk devor�, are meant to make an entrance—and twirl on dancefloors till dawn. 'tis the season to sparkle and shine, and our handbags are no exception. New to the collection is the cameron street hazel, a glamorous little chain shoulder bag done in both rose gold or silver leather, as well as a glittering gold or silver finish. Lightly pebbled leather adorned with rhinestone-diamonds and pearls comes in several silhouettes, ranging from a backpack and tiny tote to a crossbody and bucket bag. Resin clutches, with floating pearls and silver baubles, are a perfect plus-one for any soir�e. Everyday bags are holiday essentials, too (read: gift-shopping and giving). The atlantic avenue small libby is our take on a boho bucket bag, replete with grommets for a hint of downtown edge. Fall's ladylike silhouette, the cameron street sarah, is back in new core colors, alongside a velvet and floral appliqu� version of our original sam bag, reimagined for our 25th anniversary year celebration. Finally, the margaux bag debuts this December, an unlined leather tote in sizes small to extra-large. Kitten heels are favored for their walk-and-dance-ability. This season's come in classic black suede as well as a bubblegum pink with shiny studs. Pointy-toe sling backs adorned with pretty bows (a.k.a. presents for your feet) are another key style. Earrings continue to be one of the biggest expressions in the collection. A group of sparkling statement-makers are the epitome of holiday glamour. Two standout pairs defined by cascading sparkles are the ultimate finishing touch (or starting point) to any festive look. On another duo, dazzling disco balls are suspended from delicate linear chains for a dramatic, swingy effect. Hoops come crystal-encrusted in both a large and small size, and are reimagined in pearls and color-blocked hearts. Vibrant, faceted gems and mismatched earrings round out the collection. With high-performance fabrics engineered for movement, the athleisure collection combines function and fashion. Logo detail makes its way onto everything from an oversize hooded sweatshirt to track pants and jackets. A favorite style is a cropped hoodie with an embossed heart print and a color block anorak that pairs well with diaphanous dresses and sweatpants alike. Technically speaking, the collection takes on a new look with phone cases adorned in jeweled and glow-in-the-dark skylines, sparkle and tuxedo-donning penguins. Upgrades like sticker pockets and a kickstand are also available, along with innovations in wireless charging pads and retractable cords. The holiday sleepwear collection is a dreamy mix of lightweight cotton and silk tops, pant and short sets, robes and rompers in signature colors, delightful prints and finished with witty quips. Fashion accessories add the ta-da to the holiday collection with leather belts featuring heart-shaped rhinestone buckles and silky floral-print scarves in long, draping shapes.